Enable collaboration with Microsoft Teams in Office 365 while meeting your security and compliance requirements for data in the cloud. McAfee enforces DLP policies for files and messages across Microsoft Teams to ensure compliance with regulations and internal policies. McAfee supports DLP rules based on keywords, data identifiers, user groups, and regular expressions. Enforcement actions include coach users, notify administrator, block, encrypt, quarantine, and tombstone. Leverage pre-built industry templates, create custom policies in McAfee, or leverage policies in an existing on-premises DLP solution. McAfee reports on DLP violations in Microsoft Teams and other cloud services, including Microsoft Office 365 in a unified interface with highlighted excerpts revealing the exact content that triggered the DLP policy. During review, if a file does not violate a policy, the reviewer can rollback the remediation action to restore the file and/or its sharing permissions. With McAfee you have the option of leveraging our best-in-class DLP engine or the policies in your existing on-premises solution such as McAfee DLP, Symantec DLP, Forcepoint DLP, and more. McAfee optionally performs a first-pass content inspection, brokers inspection by the on-premises solution, acts as an enforcement point to apply policies to data in the cloud, and registers enforcement in the on-premises solution that maintains the policy. When using McAfee DLP, data classifications can be shared between devices and cloud services, including Microsoft Teams. McAfee captures a complete record of all user activity in Microsoft Teams and leverages machine learning to analyze activity across multiple heuristics and accurately detect threats. 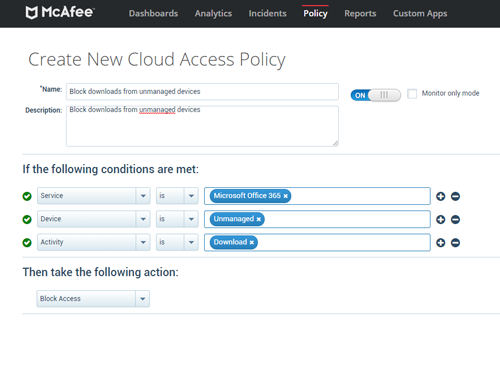 As a comprehensive cloud security platform, McAfee can detect cross-cloud threats that involve usage across Microsoft Teams and other cloud services. As threats are resolved, McAfee automatically incorporates this data into its behavioral models to improve detection accuracy. McAfee automatically constructs a behavior model with dynamic and continuously updated thresholds for each user and team to identify activity indicative of insider threat, whether the threat is accidental or malicious. Using Guided Learning, you can fine tune the detection of cloud-based threats by providing feedback to the system that is incorporated into models of user behavior to more accurately detect future threats. McAfee detects compromised account activity in Microsoft Teams based on brute force login attempts, logins from new and untrusted locations for a specific user, and consecutive login attempts from two locations in a time period that implies impossible travel, even if the two logins occur across two cloud services. Darknet Intelligence reveals user accounts for sale online that are at risk of compromise. McAfee enforces fine-grained access policies, such as allowing document preview on unmanaged devices but preventing downloads to devices without appropriate endpoint security. McAfee can also integrate with identity management solutions to require additional factors of authentication for users based on device or access patterns. Learn how McAfee helps you empower employees with anywhere access to collaboration while enforcing security and compliance policies for Microsoft Teams. Enforces DLP policies based on data identifiers, keywords, and structured/unstructured fingerprints across data at rest and uploaded or shared in real time. Enforces external sharing policies based on shared links and content and educates users on acceptable collaboration policies. Provides coach user, notify administrator, block, apply rights management, quarantine, tombstone, and delete options and enables tiered response based on severity. Offers a unified interface to review DLP violations, take manual action, and rollback an automatic remediation action to restore a file. Displays an excerpt with content that triggered a DLP violation. Enterprises, not MVISION Cloud, store excerpts, meeting stringent privacy requirements. Discovers all shadow IT cloud services employees are using in place of the corporate standard, Microsoft Teams. Displays just-in-time coaching messages guiding users from unapproved services to Microsoft Teams and enforces granular policies such as read-only access. Identifies all users and groups accessing Microsoft Teams and reveals which users are accessing sensitive data. Discovers and groups users from directory services and Microsoft Teams. User groups can be leveraged for analytics and policy enforcement. Detects URLs associated with phishing and malware in Microsoft Teams messages and blocks high-risk URLs to protect enterprise users. Enforces policies based on user, managed/unmanaged device, personal/corporate account, and geography with coarse and activity-level enforcement. Connects to cloud services via cloud provider APIs to provide visibility and enforce security and compliance policies for all users and cloud-to-cloud activity. Provides integration and closed-loop remediation with existing on-premises DLP solutions such as Symantec, Intel McAfee, and Forcepoint. 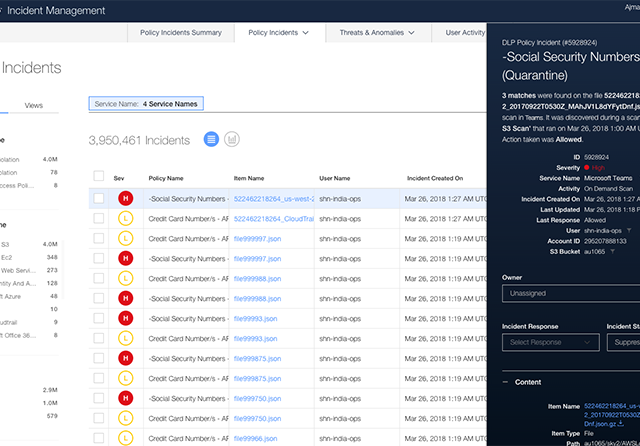 Collects log files from SIEMs and provides the ability to report on incidents and events from MVISION Cloud in SIEM solutions via syslog and API integration. Leverages identity management (IDM) solutions for pervasive and seamless traffic steering through MVISION Cloud Gateway and contextual authentication. Integrates with enterprise mobility management solutions to enforce access control policies based on whitelisted devices and EMM/MDM certificates. McAfee identifies collaboration solutions that employees use in place of the corporate standard, Microsoft Teams, and provides a risk rating for each service. Using McAfee, you can enforce risk-based governance controls and coach users to Microsoft Teams to improve collaboration while also reducing cost and risk.